I’m reading a new series of pulp fiction. Well, I guess new doesn’t count seeing as how the stories were written in the 1930’s. So, we’ll just say new to me then. The first superhero. The Man of Bronze. 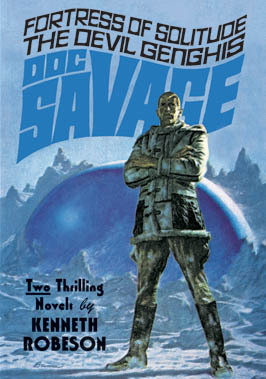 Doc Savage was written by Lester Dent in the 1930’s and 40’s, well before any other superhero was born. Before Superman, Batman, Spiderman, before them all. What’s interesting in reading these stories is how well the author Lester Dent predicted the future. Here’s a few things that stood out in the first story I’ve read. Micro Transmitter- given it was slightly larger than half a shoe box, but hey, this was before transisters. recorded and transmitted voices- copied to a phonograph, sent by radio to a radio controlled airplane, and then broadcast. I’m really amazed at how well Lester Dent got things right. I do believe I shall continue reading the different books. One of my Co-workers gave me the first 8 books in the Nostalgia Ventures series. Pulp Fiction here we come! I do believe I shall enjoy reading the series of stories. We bought a board game, Martian Rails, with inspiration from many novels of Mars. It finally became time to read the original novel of Barsoom, A Princess of Mars, by Edgar Rice Burroughs. Free on project Gutengerg! I wouldn’t call it a great book, but you can see how it must have inspired so many other stories written since then.